Plymouth Beyond the Yellow Ribbon is part of a statewide volunteer program to support military service members and their families before, during and after deployment. The City of Plymouth responded to the military’s call for assistance and developed Plymouth Beyond the Yellow Ribbon in 2010 with generous support from Plymouth City Council, Plymouth Police Chief Michael Goldstein, Plymouth Officer Randall Richardson and many others. 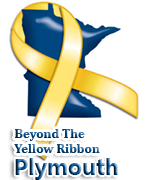 Plymouth is one of 200 cities in Minnesota to have earned Beyond the Yellow Ribbon designation. The Plymouth Beyond the Yellow Ribbon provides volunteers to help out service families with anything from fixing a broken pipe, planning a budget, helping with home organization or taking kids to ball games. While the program is community-based, it benefits from the support of the City of Plymouth and members of the Police Department. Plymouth Police Officer Randall Richardson, who served in the Marine Corps, spearheaded the Beyond the Yellow Ribbon effort in Plymouth. 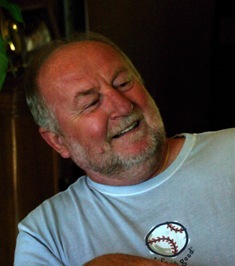 He worked with a group of community members for more than a year to meet the rigorous criteria for the BYR designation. Building a strong support network for military service members. all the way home to Plymouth!